Lynda Hill with the Beatles in 1963. I recently had the pleasure of receiving the book 'All You Need Is Hull' from it's author and compiler, Lynda Hill. For those of you that may not be familiar with Lynda, she was one of the lucky few who met the Beatles, her story is so wonderful it's like a fairytale, a dream, the inspiration for many fan fictions and the envy of all of us who were not yet born and missed out on that fabulous time. In November 1963, Lynda was a young girl, crazy about the Beatles like all the young girls in Britain at the time and when news broke of the band coming to Hull for their appearance at the ABC, Lynda was going to go and see them. Her boss at the time mentioned that she would like Lynda to queue for tickets for her and her daughter too. After queuing all night, Lynda realised that she would be late for work and just as she was about the get those golden tickets, she decided to go to work. A difficult choice but the right one. After sadly telling her boss that she didn't get the tickets, Lynda's boss decided that Lynda's loyalty to her company should not go unrewarded. 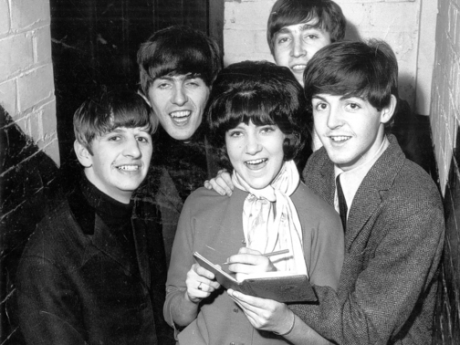 She rang the Hull Daily Mail and arranged for Lynda not only to attend the concert but to MEET THE BEATLES. "Well, in about ten minutes I'm going to take you across the road where you will meet the Beatles." Lynda was in shock. She had to sit down. A plan was hatched, Lynda would be dressed as a cleaner and smuggled into the ABC theatre so as to avoid the attention of the national press. When she was safely in the building, she was allowed to change back into her own clothes. After waiting in the hall, the Beatles appeared and were herded into a room, she caught a brief hello from them all before they were gone. After an agonizing ten minute wait they reappeared and sat down with her and the above photograph was taken. Lynda's book has all the stories from fans from around the Hull area who either saw the Beatles play in Hull or met them. It's a wonderful book with many treasured memories from the fans who were there in 1962, 63 and 64 and saw the Beatles play. What's interesting to note is their first appearance in Hull in 1962 was seen by less than 40 people as it was Hull Fair Week. Their second appearance in early 1963 was more frenzied as Beatlemania in the UK was on the climb. By November that year, their popularity was at an all time high and fans queued overnight for tickets. By the time of their last appearance in the city in 1964, the mania had subsided somewhat. One fan recalled being able to just walk into the box office and buy the tickets and not having to queue in 1964.